Zea Mays Printmaking is offering a subsidized fellowship for a 2-week residency in our printmaking studio to one printmaker who demonstrates artistic excellence, a love of printmaking and the intention of future achievement in the field of safer and non-toxic printmaking. Our residency offers the artist a private studio within the larger Zea Mays Printmaking facility. 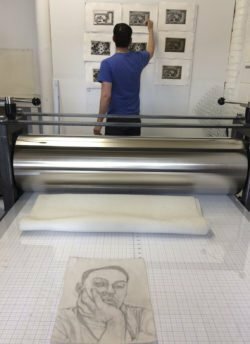 The residency studio has a beautiful 40″ x 72″ Takach etching press, large worktables and 24/7 access. Residency artists are housed in our on-site apartment which includes a full kitchen, bath, sitting room and private bedroom. Access to the studios’ etching, screen printing, photopolymer and letterpress facilities is available during open studio hours.